This content is brought to you by First Student. Keeping children safe on the school bus is not only the role of the bus driver, but also the role of the school district and community. Read on as Darryl Hill, First Student’s senior vice president of safety, provides five tips to improve school bus safety; then download the free whitepaper for even more. 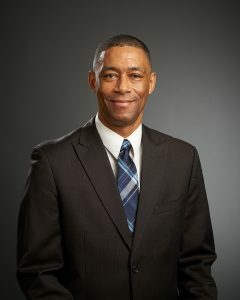 Darryl Hill, senior vice president of safety for First Student. What do student transportation providers do to ensure they provide the safest daily journey for students? 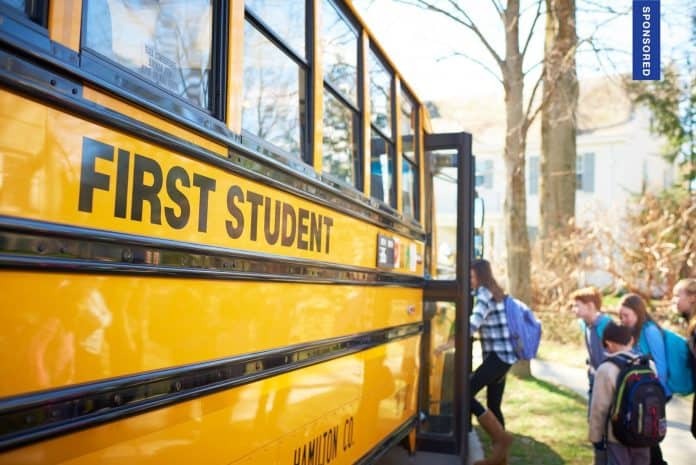 Student transportation providers promote a safety culture through comprehensive training programs, rigorous background checks, and employee behavior positive reinforcement. Innovation and technology advance safety and efficiency to provide a positive student journey experience. Additionally, proactive maintenance programs are designed to exceed districts’ expectations for manufacturer service levels. GPS devices monitor driver performance in key areas to ensure a safe journey. How can schools monitor, report, and improve student behavior on the bus? Conduct issues on the bus can be unsafe and disrupt the school day for students. Encouraging appropriate bus behavior can ensure an enjoyable and safe ride for everyone. Improving student behavior on the bus requires a partnership between a district and student transportation provider. The expeditious handling of incident reports, incorporating the bus into the school’s PBIS program, and sharing information about those students with disabilities and their behavior concerns, will help better serve a student’s individual needs. Consistency in tracking, reporting, and correcting school bus incidents is the first step in ensuring the bus ride is a positive experience to start everyone’s school day. Consistent student training also goes a long way toward improving bus behavior. Watch below to see how Safety Dog, First Student’s safety mascot, helps students put a face on safety while understanding the importance of safe school bus behavior. Have you identified any lasting or emerging trends in safety that apply to student transportation? Security is a key trend that will increase in importance in student transportation. Key components for a proactive security process include site security risk assessments and emergency preparedness and responses. Additionally, active shooter awareness and education are key considerations within the school transportation industry. Stakeholder partnerships that include security organizations, school administrators, and parents will facilitate a growing trend to deploy a holistic approach to student transportation security. What can communities do to help ensure their residents adhere to the stop arm? Communities should partner with their state agencies and local communities to implement a successful stop-arm compliance program. The program should include education, awareness, and enforcement. The entire community, including law enforcement, residents, and the school district, should be educated and understand the law, and what compliance and non-compliance means. Student transportation providers are key in this program, as they should provide another source of awareness and compliance, by properly educating school bus drivers. Progressive communities have awareness programs at civic centers that educate motorists on the law and consequences for not obeying the law. An education/awareness activity may include a variable message board that is located in problem areas, identified by parents and drivers. It is imperative that law enforcement serves as a deterrent against illegal passing. Patrol officers, working with traffic officers, during school transportation hours, should conduct speed enforcement and stop-arm compliance operations near bus stops and school zones. The hope is that through education, awareness, and enforcement, communities can ensure that students are safe during the onboarding and offboarding of the school bus. What are five tips for school bus safety? 1. The importance of a comprehensive training program is a cornerstone for student transportation providers. Whether you choose to self-operate or contract your school bus transportation, a comprehensive training program should include quality classroom instruction, behind-the-wheel skill courses, and road supervisors that periodically monitor driver performance. Evaluating driver training program effectiveness will measure trainee reaction and if learning occurred. Most importantly, training should change behavior and lead to improved safety performance. 2. A student transportation provider must demonstrate that a positive safety culture begins at the top level in the organization. The strongest predictor of safety performance is leadership and safety culture. A leader should conduct touchpoints with team members to reinforce safe critical behaviors. Recognizing team members that adhere to safety policies and procedures should be encouraged. 3. Recognizing the key role of dispatchers is integral to promoting safety. The dispatcher, along with other safety-minded operations leaders, can administer “Fit for Duty” checks with drivers. Dispatchers should be trained to ensure every driver is physically and mentally prepared to safely operate a school bus. Dispatchers can also provide a calming influence when communicating to drivers, especially in a difficult situation. 4. School administrators should identify the appropriate technology innovations that support the district’s strategy and financial plan. New technology should be considered once a positive safety culture and the appropriate policies and procedures are in place. 5. A rock-solid partnership between the school district, parents, and the student transportation provider will strengthen the safety environment, allowing a positive experience of working together, for the shared purpose of keeping all students safe. 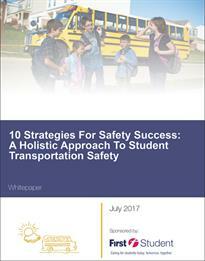 Download the white paper “Strategies for Safety Success: A Holistic Approach to Student Transportation Safety” to find 10 ways you can develop a safety mindset in your transportation department AND community to keep your students safe. Every day. Let us show you how contracting with First Student can simplify your life. We offer more than 100 years of transportation expertise. From route optimizations and specialized management teams to full turn-key operations, we have the experience for every situation. Our locally-hired teams are professionally trained. You focus on driving your students’ imaginations, we’ll focus on driving them safely. Contact us to learn more.